Satellite Falling is a new series from IDW Publishing due out in May. 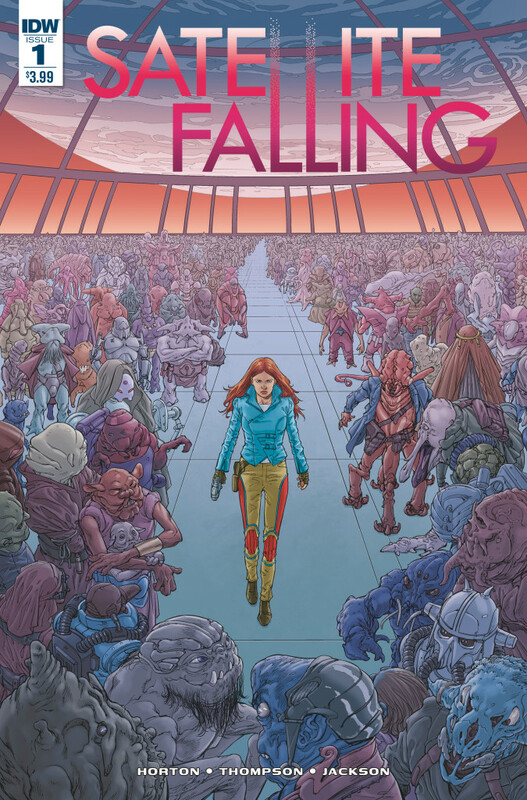 The book's two creators (Steve Horton and Stephen Thompson) are keen on talking about the book and sat down with Omnicomic for an interview about the book itself, creating good science-fiction and changing art styles. Check out part 1 of the interview below. Omnicomic: What's the elevator pitch for Satellite Falling? Omnicomic: Where did you come up with the concept for Satellite Falling? Horton: Remember that 1970s DC comic, Space Cabbie? I thought it'd be neat to do a modern take on that concept, with even more space opera. Omnicomic: What do you feel is the most important characteristic in creating a good science-fiction book/universe? Stephen Thompson: Personally I find it best when sci-fi is used to amplify and mirror what's going on in the here and now. It's an excellent way to draw current problems and situations out to an extreme degree so they become clearer. Omnicomic: Steve, you also worked on Amala's Blade, where the main character Amala was an extremely capable female fighter. It appears the main character in Satellite Falling is also a strong, capable female. Is there something about writing such characters that appeals to you? Horton: Sure. The world has enough grizzled white dude comics (and games, and movies, and TV shows). I've been lucky enough to be surrounded by strong woman role models for half my life, so it's only natural that it comes through in my storytelling. Omnicomic: Who would you consider to be your artistic influences? Thompson: Oh, that'd be a huge list but I think Frank Quitely, Katsuhiro Otomo and Satoshi Kon are the artists I find myself looking at the most these days. Omnicomic: Art styles have changed over the decades when it comes to comics and much of the change was in response to the stories being told. Do you adjust your style at all to the character/setting? Or do you prefer to keep it fairly consistent across all your work? Thompson: I don't think art has changed particularly because of story, it's mostly fashions in art and changes in the technology of printing that've kept things moving. I've certainly moved towards a more open, linear style and away from rendering because so much of that can be handled more elegantly and naturally by a good colorist these days. Check out Part 2 of our interview here.